Kerosene heaters produce very little carbon monoxide! Simply having a window barely open is sufficient to replace any oxygen consumed in the combustion process and vent the few fumes produced. Unvented kerosene space heaters have full UL approval to burn in a house, period. They would not have UL approval if they killed people. There has never been a house fire, injury or death caused by a faulty kerosene heater - and they have been in use for over a century. Last year there were two (2) house fires in the entire US caused by people knocking over their kerosene heaters on which the safety tip-over switch had been disabled (and one so far in 2008), which obviously cannot be blamed on the heater itself. I'm willing to bet there were two (2) houses burned down in the US last year per county because idiots put hot wood stove ashes in cardboard boxes out onto a wooden porch or deck! Which is unsafe? Every day there are house fires (and resultant deaths) caused by electric space heaters and other "safe" electrical devices, compared with none by kerosene heaters in over 100 years. Yet woefully ignorant "preparedness" experts tell people that kerosene heaters are dangerous and other space heaters are wonderful. Those "experts" must be secretly into population control. Another example. Because the ancient buildings involved make renovation almost impossible, many people in Holland and on the island of Malta use kerosene heaters. Thirty miles across the English Channel, the UK "British Standards" (appropriately "BS") all but outlaw kerosene heaters as being unsafe!!! The State of New York agrees with England - kerosene space heaters are outlawed. Connecticut and Pennsylvania have contiguous borders with NY, and half the people it seems in CT and PA heat with kerosene heaters, so many that corner service stations have a pump dispensing 1-K clear kerosene for their convenience. The commonality between NY State and England? Why are kerosene heaters suddenly dangerous when they cross the state boundary into New York? The natural gas industry has much more political muscle than kerosene heater stores, so they reportedly got the competition outlawed!!! How many people in New York freeze to death during winter storms when the power goes out and they have been denied kerosene heaters? It would appear the state legislators in New York are more dangerous than kerosene heaters. When using a kerosene heater, always keep a window cracked open a little for ventilation. Is that for removal of dangerous fumes? NO!!! It is for oxygen replacement. Anything burning consumes oxygen. That includes wood stoves and natural gas appliances! 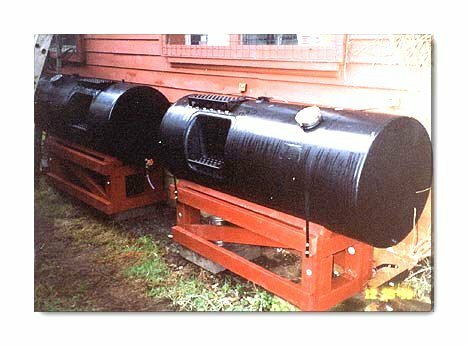 An airtight home should have a window opened a bit if a wood stove is being used, and in fact many states have laws mandating a source of outside combustion air for modular home wood stoves because they are sealed so tightly. In fact, in a well-sealed home a window should be opened a half inch when using a clothes dryer, even an electric model, as it expels oxygen from a home! The resulting negative air pressure makes opening a door to the outside difficult, and when the door is opened, air - and dust, debris and leaves - are sucked into the house. This comment about ventilation is issued in perhaps an overabundance of caution, but nevertheless had to be mentioned because it is impossible to know every place a heater could be located. Older structures were always drafty and have more than enough ventilation - in fact often enough "ventilation" to require giving some thought to sealing and insulating them to conserve heat! From the first Perfection heater in the early 1900's, all the way through the Aladdin Blue Flame heaters and indeed every heater made up until the 1970's, no tip-over switches were used. And there were no house fires caused by faulty heaters. Beginning in about 1978, the insurance companies for private stores required UL Approval as a condition of issuing business insurance, and that mandated the tip-over switch. It was not driven by a safety issue. Extinguish candles when you leave a room. Be careful not to splatter wax when extinguishing a candle. All fuel should be treated as if it were very volatile. Store fuel in an isolated area that is downhill and down wind from other buildings. Liquefied petroleum (LP) gas tanks should be left out in the open (no enclosure). Liquid fuel tanks should be stored in a well-ventilated building. A fire extinguisher should always be near the stored fuel area. Electrical fixtures should be sealed from the fuel vapors. Always shut down the machine before fueling it. Clean up any fuel spills. Only use the approved fuel types for your appliances and storage containers. If you are going to store gasoline, it needs to be treated with a butylated hydroxytoluene (BHT) additive like Sta-Bil and shielded from moisture. For #2 diesel, you need to add 10% gasoline or 20% kerosene in order to prevent “fuel freezing”—the precipitation of the paraffin at low temperatures. Ethanol should be stored in a sealed container to prevent moisture contamination. A general rule of thumb is to monitor your fuel usage for 90 days and keep a supply large enough to last you this period of time. Kerosene burning appliances are safer than LP gas appliances. If you are storing diesel fuel, it needs to be treated with a biocide such as methanol or diesel Sta-Bil right after delivery. It should also be filtered before use. OCEANA COUNTY -- Oceana County fire investigators have determined a kerosene heater caused the deadly fire that started inside a mobile home Sunday in Grant Township's Lake Tahoe area. Craig Lee Ford, 50, and David Norman Branch, 65, died inside the mobile home at 5750 S. Oneida Trail. Lela Campbell, 50, owner of the mobile home, also lived at the New Era address with the two men and managed to escape the blaze without serious injury. Contacted by a Chronicle reporter this morning at Hackley's Lakeshore Hospital where she is being treated for smoke inhalation, Campbell said she was doing OK. She said she was unable to give details of the incident this morning as members of the Red Cross were there assisting her. Grant Township Fire Chief Roland Brooks said investigators believe the blaze ignited just after 8 p. m. when one of the victims knocked over the kerosene heater that was in the living room space of the mobile home. Both men had been sleeping before the fire broke out, Brooks said. It was not clear who knocked over the heater, he said. "One gentleman got up to go to the bathroom or had a seizure and knocked the heater over. One of the men had a problem with seizures," he said. Brooks said fire officials were baffled as to how Campbell got out but the others didn't. "Lela walked out the back door on the porch and started hollering for help, and the neighbors heard her. We have no way of knowing why the others couldn't get out. That's what everyone is wondering -- why they didn't get out." The mobile home was engulfed in flames when firefighters arrived. The Shelby-Benona Fire Department assisted. The investigation is now closed, Brooks said. Meanwhile, Campbell is slated to be released from the Shelby hospital today, Brooks said. "Lela is going to stay with her sister until she can find an apartment," Brooks said. Members of the victims' families could not be reached for comment this morning. Funeral arrangements had not been announced. When I was a kid back in the 50's and early 60's, they were all we had and seemed to work okay. My folks never had a big heater like they sell today. We had several Perfection heaters and used them in different rooms. Now, we lived in Texas, so never had the hard winters that you folks up in the far north have. Anyway, I never heard of anyone burning down their home with a Perfection heater and I'd guess that about half the folks in town where I lived used kerosene heaters in the winter. My Aunt Lizzie heated with kerosene heaters for over 50 years! When she got old, in the 1960's, a niece thought that kerosene was dangerous and convinced the old lady that she was going to die if she kept using kerosene. So, the niece took out her Perfection heaters and put them on the porch. Around Christmas of 1968, Aunt Lizzie had a fire alright. Her ELECTRIC heater shorted out and burned down her house. She died in the fire. When the volunteer fire department got to her house, they found her Perfection heaters on the porch, cold as she was. The kerosene heaters didn't kill her, the "safe" ELECTRIC heaters did the job. Although home candle fires fell 8% from 2004 to 2005, more than twice as many were reported in 2005 as in 1990. Candle fires accounted for an estimated 4% of all reported home fires in 2005. Thirty-eight percent (38%) of home candle fires started in the bedroom, resulting in 41% of the associated civilian deaths. December is the peak time of year for home candle fires. In December, 13% of home candle fires began with decorations compared to 4% the rest of the year. More than half of all candle fires started when something that could burn, such as furniture, mattresses or bedding, curtains, or decorations, was too close to the candle. Falling asleep was a factor in 12% of home candle fires and 26% of the associated deaths. The top five days for home candle fires were Christmas, Christmas Eve, New Year?s Day, New Year?s Eve, and Halloween. Source: NFPA's "Home Candle Fires" report by Marty Ahrens, September 2007. An 84-year-old woman died at a Burlington County hospital Monday night two days after drinking tiki torch lamp oil she had mistaken for apple juice. An 8-year-old girl from North Jersey made the same mistake earlier this month and was hospitalized in critical condition for several days. The child survived but suffered serious injuries to her lungs. Four other New Jersey residents have been sickened since May by accidentally drinking the amber liquid. "Lamp oil bottles closely resemble juice containers and the colors of those fluid is indistinguishable from juice," said Bruce Ruck, spokesman for the New Jersey Poison Information and Education System. When consumed, it causes coughing and choking which sends the volatile liquid into the lungs. Pneumonia and death often result, he said. "If you drink it by accident, don't stick you finger down your throat, that will make it worse," Ruck said. "Don't drink a lot of fluid. That will make it worse. Immediately call a poison center. Depending on the scenario and symptoms, we can help them make a decision."